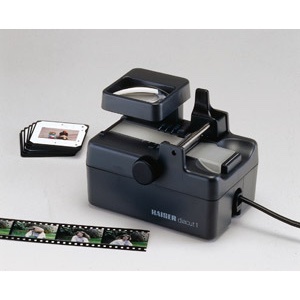 Slide cutter for film cassettes, cartridges size 126 and 35 mm film. Very easy and accurate cut by self-sharpening rotating round blade in closed plastic housing. Film transport roller for exact size positioning at frame line. Size markings for 18 x 24, 24 x 24, 28 x 28, and 24 x 36 mm. Fingertip recesses for easy removel of cut slide. Illuminated viewing zone. Detachable lift-up 2.5 x magnifying glass. Alignment markings for use with mounted slides.